Supergirl may still not know exactly what message it wants to send about discrimination and violence, but “Bunker Hill” was well-crafted enough to put themes aside for a week in favor of diving into the inner workings of several characters. 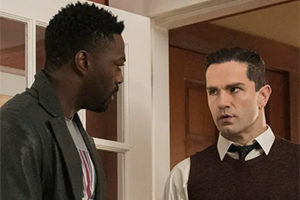 Most notably, viewers got the first real exploration of Nia Nal’s (Nicole Maines) powers and the first climax of Manchester Black’s (David Ajala) vendetta against Agent Liberty (Sam Witwer). With friends like these, who needs armies? The opening scene of “Bunker Hill” confirmed that Nia’s naps were caused by her refusal to sleep for fear of experiencing a nightmare, which is exactly what happened when her (amazing and hilarious) roommate decided to let her rest. She woke up in a cold sweat after witnessing Agent Liberty wielding a gun at a screaming woman, and the horror of that dream stayed with her at work the next day. 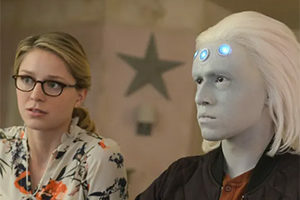 Kara (Melissa Benoist) was concerned enough to share the problem with her sister, incidentally roping Brainy (Jesse Rath) and his future knowledge into an intervention. And thus began the most adorable – and dare I say most useful – team up of the season. Surprisingly enough, for those who don’t know their DC Comics history, Nia revealed that she was an alien from the planet Naltor and that she was one of the few members of her family to possess the unfortunate gift of sight. Unfortunate because she had no idea how to control it or how to help the victims in her visions, which made her power more of a burden than anything else. But as fate would have it, Brainy already knew much of this information and was more than willing to help “Nura” access some of her potential in time to uncover the identity of the frightened woman in her Agent Liberty nightmare. Soon enough, they discovered that woman was none other than Ben Lockwood’s wife Lydia, which is where Supergirl tied both major storylines of the night together expertly. Undeterred from his mission to save Manchester’s soul, J’onn (David Harewood) tracked his friend’s whereabouts via telepathy and incited a mental power struggle with him – all while Manchester himself was playing a dangerous game of emotional chess with Ben. Given that Nia’s dream told us the threeway encounter could easily end in blood, the stakes felt incredibly high as Black and Lockwood played cat and mouse with each other, pretending to be university colleagues as Lydia looked innocently on. But tensions turned to legitimate violence once Manchester exposed Ben’s secret identity to his wife and then threatened her life as payback for Fiona’s death. “Bunker Hill” became a race against the clock for many of our characters, and it ended in a the first truly earned battle of the season, but it wasn’t without its moments of humor. From Brainy greeting Nia with “Hey, girl” before toppling over to Kara giving the name “Kara Liberty” and turning their kidnapping by minions into a good sign that they were on the right track, the episode was peppered with chuckles that enhanced the darker sequences rather than detract from them. Bonus points for the Lois Lane shoutout too, since the crossover is only a week away. Speaking of the crossover, the final scene of the night would have made even a much weaker episode worth it thanks to a John Wesley Shipp cameo that did more to raise expectations for “Elseworlds” than most of the promo had. Escaping from the Liberty gang was a group effort, and both Nia and Brainy got to show off impressive abilities that underscored how much of a boon they’ve been to Supergirl this season. but the emotional weight of the way lay in the later fight sequence, which was split between Supergirl preventing Agent Liberty from hurting anyone (once she figured out he and Ben were one and the same), and preventing Manchester from hurting anyone. His self-dubbed “Intolerant Left” title was the line of the night, but he ended said night in a cell reflecting on his actions. As moved as I was by J’onn’s continued faith in him and by Manchester’s acknowledgement that he needed to change, I was a little confused by what prompted his apparent change of heart. Perhaps it was merely his gratitude talking. Alex (Chyler Danvers) also had a role to play in the “Bunker Hill” proceedings, as her interrogations were the ones that confirmed Agent Liberty’s identity and allowed for his arrest. But to her shock, the President of the United States was less interested in justice and more worried about poll numbers. So when it turned out that “human rights activists” were outraged at Ben Lockwood’s arrest, instead of a commendation she received orders to unmask Supergirl… And fire her if she didn’t comply. Now Kara is out one of her jobs and all of her government backing, which puts her and the entire DEO in a very precarious position come 2019.